Homesteading made perfect. Sit on the front deck and enjoy the beautiful mountains and sunsets. Dine under the covered porch or sit by the cozy fire pit. This custom beautiful Chink Log Home with a metal roof produces a classic look! The porch runs the full width of the front and side of the log home. The landscaping is finished with beautiful stonework and two dormers on the front of the log home plus lots of windows towards the mountain view enhancing the visual appeal of this custom log home. Indoors, the interior walls and ceilings are finished in beautiful stained wood logs and exposed crossbeams adorn the two-story A-frame ceiling in the main living area. Beam-style steps with a rustic log hand rail lead to master and loft upstairs. 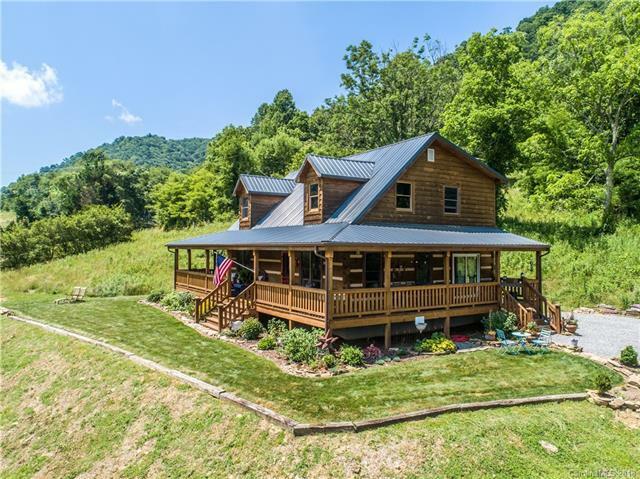 This chink log home epitomizes "country living, so check out the pictures in the gallery! Ideal place to homestead with plenty of room to spread out, not be crowded with neighbors just surrounded by the mountains. Sold by J D Jackson Associates, Inc..